The importance of ethical care, informed consent, and advanced directives are widely underestimated in health care settings. The more familiar you are with these vital aspects of clinical practice, the better equipped you will be at providing higher quality patient care. This course covers the fundamentals of ethical care, the informed consent process, and various types of advance directives in medical and behavioral health care settings. Interactive exercises and vignettes will give you the opportunity to apply the concepts you learn in this course. After completing this course, you will be able to provide your clients a higher standard of care by offering them ethical and well-informed treatment. 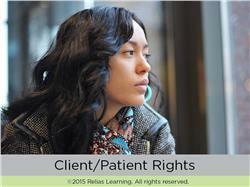 Summarize the Client Bill of Rights and the six principles of ethical care. Recount the process for obtaining Informed Consent. Interpret behavioral health advance directives. Jonathan Bennett is a Client/Patient Rights Advocate and Educator. He has worked in the field of client/patient rights for more than 16 years. He is currently in private practice. He was previously director of the rights protection system for a six county community mental health center in Michigan, where he was twice recognized by the state for innovation and advocacy in rights protection. In his career, he has directly investigated or supervised the investigation of thousands of alleged rights violations and provided consultation services to scores of provider agencies and staff, clients/patients, family members, legal representatives, and the general community. He has developed and presented numerous trainings in client rights in classroom settings, self-guided online formats, and at conferences. Disclosure: Jonathan Bennett has declared that no conflict of interest, Relevant Financial Relationship or Relevant Non-Financial Relationship exists.